Thursday’s decision followed an extensive period of public comment during which the proposal received criticism from wildlife advocates and support from hunting associations and livestock industry representatives. In a presentation at the meeting, Darren DeBloois, game mammals coordinator for the Utah Division of Wildlife Resources, said the increase in hunting permits coincides with an observed increase in the cougar population as the state’s mule deer population also rises. The state’s cougar management plan allows a limited number of hunting permits to be issued in different areas of the state, typically utilizing a limited entry system. Permits cost approximately $60 for state residents and $260 for nonresidents. In Southern Utah, several areas will see an increase in permit allotments, including one additional permit for the Beaver and Mt. Dutton unit, two more for the Zion and southwest desert units, three more for the Fillmore-Pahvant unit, as well as some additional permits in the state’s southeast region. The DWR does not expect all of the 581 permits issued to result in successful hunts. Of the 531 permits issued last year, only 400 cougars were taken. Key to the cougar management plan is keeping the number of female mountain lions harvested in a given season below 40 percent. 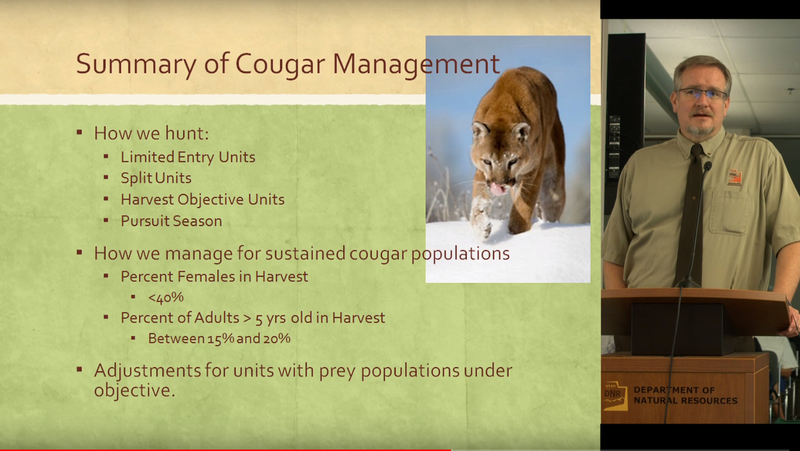 The plan also calls for adult cougars age five years and older taken to be between 15 and 20 percent of the overall harvest in order to limit disruption to mountain lion social structure. During the 2016-17 season, 28 percent of cougars taken were females, and 23 percent were five years of age or older. The DWR pays land owners for confirmed loss of livestock due to predation. However, the compensation budget is limited and typically unable to fulfill the full-dollar value of losses, which is one reason cited by the DWR for increasing predator hunting permits. They eat a lot of sheep. They eat a lot of lambs … Every pasture we’ve gone to this year – this is the first year I can say that – have been depredated by cougars. There’s been six different pastures. Usually, it’s one or two that we get depredated on. This year it’s been all the mountain pastures that we range on and we graze our livestock … It’s a huge financial loss to the sheep industry. 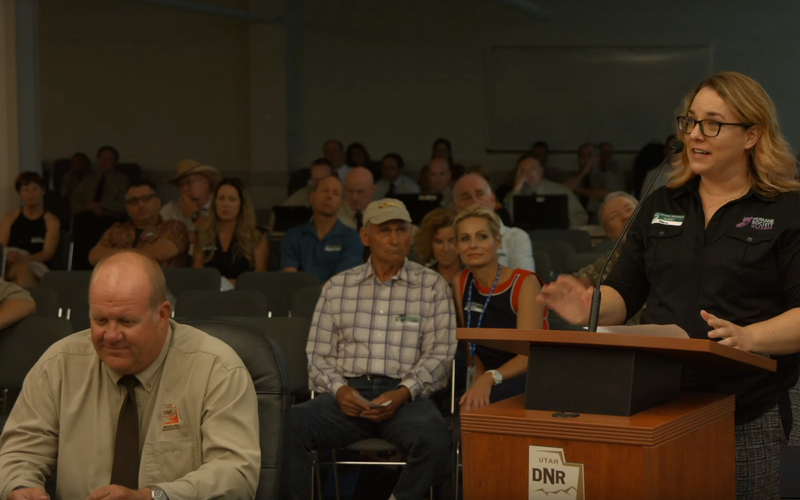 During the meeting’s public hearing, several people took issue with the DWR’s cougar population estimate, thought to be between 1,900 and 4,000 animals, saying the estimate isn’t exact enough to allow for an increase in hunting permits. “It seems like the precautionary principle would suggest that we harvest something between 10 and 15 percent of what we think is our population instead of 20 to 25 percent, which I fear may be happening this year in Utah,” said Allison Jones, director and conservation biologist for the Wild Utah Project. A more precise population estimate is difficult to come by, given the difficulty involved in tracking the elusive-by-nature cougars, said Dan Cockayne, president of the Utah Houndsman Association said. Cockayne, who offered his support for the increase in hunting permits, said the increasing cougar population is thanks in part to monetary contributions from hunting associations that have helped grow the big game animal populations upon which mountain lions prey. Deann Shepherd, marketing and communications director for the Humane Society of Utah, said nonlethal predator management should be employed whenever possible. Bill Christensen of the Rocky Mountain Elk Foundation said he supports the increase on behalf of the foundation, adding that all wildlife needs to be managed, whether prey or predator. “Just because an animal has some strange attraction for some people,” Christensen said, “we need to be clear: Science dictates that we manage all wildlife. Kirk Robinson of the Western Wildlife Conservancy said the Wildlife Board should take humane treatment of animals into consideration, questioning whether the decision to increase hunting permits was done primarily in the name of sport. “The concern here is for cougars themselves as individual animals – living, breathing animals that experience emotions and have their own concerns,” Robinson said, “and the idea that perhaps an enlightened ethic would say we ought to respect that. Hunting these and other predator animals (as well as elephants, etc) is done for sport, and really there is no other reason. People just like to shoot. This isn’t “management” … the gov doesn’t even have good numbers on how many. As for ranchers, UTAH can set up an insurance plan ranchers would pay into for stock that the predators take. UT is just “hunting crazy” and I never will understand why or how they like this as sport. I love target practice but I don’t need predatory animals to aim at to get a kill thrill. DWR is essentially using the successful permit holders to indirectly verify the population guesstimate. If 400 out of 531 animals were reported to be harvested, then one has to ask if their population estimate is overstated. I will have to assume that there is minimal illegal hunting. By looking at historical data from their PowerPoint slide, it appears there has been a slightly upward trend if we look only at the most recent 10 years. I could not imagine DWR funding a more detailed census, so this indirect method is all we have. 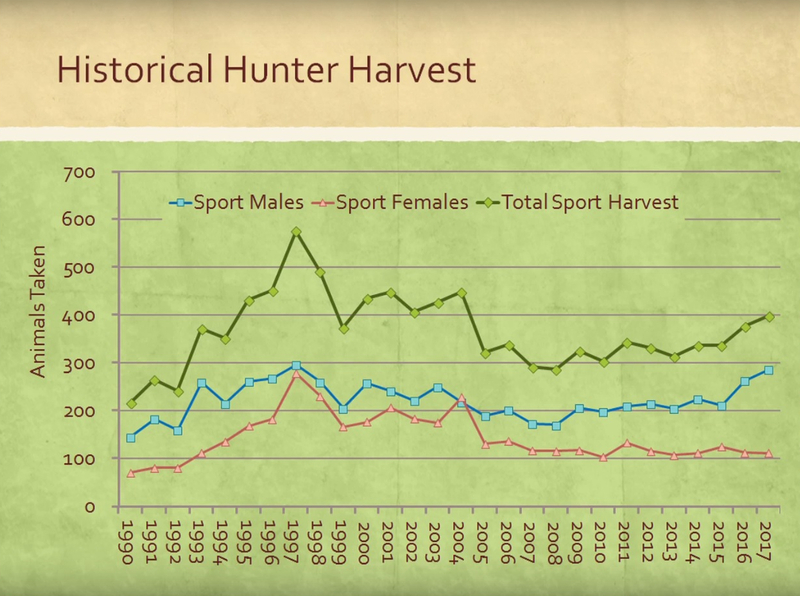 One thing that would be useful is a survey of the 400 successful harvesters, to understand if they saw more animals that were not taken. Plus, out the 131 permits that were not converted to a harvest, did these hunters use their permit, and where were they hunting? I assume that since these permits cost at least $60, the hunters would have attempted to find an animal. It’s a good thing the Elk and Cougars dont have meetings to discuss how many of us to take out. Can you imagine human heads hung up on the cave wall in the cougar den. kitty kats should never be this big and mean. i say we kill them all. wildlife conservation is for libruls and treehuggers. don’t need it ’round here!